What do you think when you hear "6%"? Chances are, if you're interested in the Civil War or Civil War memory, you may recognize 6% as the number of white Southerners who owned slaves in 1860 (some say 5%. Whatever). In many apologetic texts, this number magically morphs into 6% of Confederate soldiers (or fewer!). Nevermind that recent scholarship puts the number of Confederate soldiers who lived in slaveowning families at well over a third. This statistic is always dragged out to "prove" that the average Confederate soldier was absolutely not fighting to preserve slavery. It's not just the crazies who argue that very few Confederate soldiers were slaveowners — this stat is pretty well accepted by people who are not inveterate Lost Causers. "[T]he vast bulk of Confederate soldiers did not own a single slave," writes Robert Mackey of the Huffington Post "and many from the most rural areas had never even seen a black man or woman in their lives." Where did everybody get this number? It seems that the argument that minuscule numbers of Southerners were slave owners come from sophisticated mathematical formulas that divide the number of slaveowners on the 1860 Census (316,632 in the 11 Confederate states) by the total population of white Southerners (5,447,220 in the CSA). That gets you 5.8%. I am no math genius, but there seems to be a problem here. The 1860 Slave Schedule lists slaves under the name of the legal owner, who is generally a man and the head of a household. The women and children living in the household were not legal slaveowners, but their inclusion in the data dilutes the percentage of white Southerners who owned slaves to the point of absurdity. Using similar logic, you could "prove" that fewer than half of Americans own cars. 1. 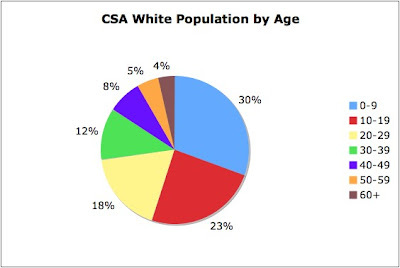 Over half of all white Southerners were under the age of 20. Of the 5.4 million white Southerners in 1860, 30% were under the age of 10 and another 23% were between 10 and 19 years of age. Very few of these children owned slaves. Those who did were generally under the protection of a guardian who would have been listed in the census as the slave owner. *Maybe. 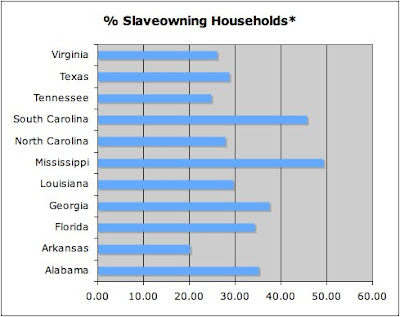 I came up with these percentages by dividing the number of slaveowners by the number of households in each state. It is entirely possible that a household could have more than one slaveowner listed in the Slave Schedule, but my preliminary readings of that document indicate that that's pretty rare. These percentages should not be interpreted as a random sample of households, but as rough numbers. My real point here is not that these numbers are perfect, but that 6% is way, way off. 3. The 1860 slave census both overcounts and undercounts slave owners. When the people indexing the census counted this entry, did they count it as one slaveowner? Two? Three? 4. The 6% figure obscures the number of white Southerners who lived in slaveowning families. Duh. Let's take the case of William C. Riddle of Washington Co., Georgia. Riddle owned 92 slaves. On the 1860 Slave Schedule, he is the only member of his household listed as an "owner." This household also included Riddle's wife, their five children, and two 26-year-old male tutors. It may be technically true that only 11% of the whites in the Riddle household were slaveowners, but that number does not reflect the historical reality. Little John Riddle, age 10, owned no slaves, but he expected to inherit them when he grew up, as did his four sisters. Thomas Evans and James Griffen, the two tutors, owned no slaves, but their jobs depended on the Riddle family's continued prosperity. I doubt that they made their own beds or saddled their own horses. Should they be counted as people who did not have a direct connection to slavery? What about David Clark, the 21-year-old who owned no slaves, but whose occupation is listed as "overseer" in the household of Rufus King of Haywood, Tennessee? What about Robert Martin's five non-slaveowning sons (ages 17, 15, 13, 10, and 8) of Abbeville, South Carolina? In 1901, Samuel French wrote, "let it be known that the Confederate army was not an army of slave owners." Confederate apologists near and far have taken that tidbit and run with it. It turns out not to be entirely true. Some will say that the 37% quoted by Joseph Glatthaar in General Lee's Army is still small, but I would point out to them that Glatthaar is only talking about soldiers who "either owned slaves themselves, or the parents or family members with whom they resided in 1860 owned slaves" (Glatthaar, 468). I'm not sure whether he includes those tutors and overseers, who were not family members in their 1860 households. In any event, it is a logical fallacy to conclude that just because someone didn't own slaves he neither aspired to ownership nor supported the slave system. For more on that, see Masters of Small Worlds on the importance of white male mastery over the private household and dependents. The slave system upheld the independence of all white men, whether they owned slaves or not, and all had a vested interest in keeping it up and running. P.S. Also, I know that this is going to come up, so I'll nip it in the bud. Yes, some women and some free African-Americans owned slaves. Their numbers don't change my conclusions. Since women who are listed as slaveowners are likely to be heads of households, their inclusion doesn't change the percentages listed in part 2. The number of black slaveowners is very small, certainly too small for it to make sense that 2 of the first 4 Google hits for "Confederate slave owner" are dedicated to the subject. From these preliminary forays into the records, I'd say women make up fewer than 10% of slaveowners (that's an educated guess, not a quote-worthy number) and the largest estimate of black slaveowners I've ever seen is 5,000. Maybe for my next project I'll investigate those numbers. After all, there were fewer than 150 black slaveowners in Charleston in 1860. I've seen the number 3,000 quoted for Louisiana, but the slave schedule makes me a little skeptical. Look at this page from Bernard Co., Louisiana (click to enlarge). There are two names in the "Name of Slave Owner" column that belong to black men — "Big James slave" and "Charles slave." They are both listed as being 100+-year-old fugitives who are listed on the last line along with the total number of slave houses on the plantation. I don't think they were really slaveowners, but that's how they're listed. How were these two men counted by the indexers? It's obvious that there were some black slaveowners, but I wonder about the numbers when the census contains ambiguous entries such as these. Actually, truth be told, the total number of white people in America (North & South) in 1860 who were slave owners was less than 3%. As for free Negroes in the southern states, about 10% of them owned slaves. So that means that free blacks were 3 times more likely to own slaves than free whites in the southern states. How ya like them apples?! I think you didn't read the post. why was the post by Levin taken down? I checked his page, and he appears to be a qualified Civil War expert. You'd have to ask him, as he took it down himself. It says "removed by the author," which means he posted something and decided to remove it. If I had removed it, it would say "removed by the blog administrator." While I do belive the number is higher than 6%, the logic of this article is somewhat flawed. By 1860 fewer slaves were being imported and more were beeing bred. Therefore, the very logic used by the writer here to prove his point could also be used to disprove it. Just as there were white women and children who didn't own slaves and therefore skew the percentage so there were also slave women and children who were rarely owned independent of slave males by 1860. They idea was that you needed both men and women slaves in order to produce children slaves and increase wealth. Sadly, it was much like breeding livestock to them. So it follows that just as including white women and children as a percentage of the total, so also omitting slave women and children equally skews the data. You do not seem to understand the data here. The 1850 and 1860 slave schedules include enslaved women and children. They are not omitted. Whenever I comment to any of my black friends on this subject they never believe me. Even if I could show them the proof they would still deny it. I'm not sure what you mean. Your "black friends" would not believe that between 20 and 50% of white households owned slaves in the various Southern states? And why can't you show proof? I like this analysis. The way you construct your starting assumptions on which to run the numbers is a lot clearer and more honest than merely using the uninterpreted data. "In any event, it is a logical fallacy to conclude that just because someone didn't own slaves he neither aspired to ownership nor supported the slave system." By and large, owning slaves was the privilege of the well-to-do. The rank and file of the Southern armies was composed of farmers and laborers who volunteered to protect home and everything dear from Northern invaders, to keep their traditions and be left alone." -James I. Robertson, Jr. in "Tenting Tonight". In direct response to you: Like the quote by Professor Robertson suggests above, it's also a logical fallacy to assume that men who fought for the North cared one way or another about the fate of slaves in the South. What's funny is, you've made some very liberal extrapolations with your research, and you did not take human nature and the general state of the southern economy into account at all. Nearly 2/3rds of which could never afford to by a slave, much less sustain one or more over a period of time. Furthermore, there's no guarantee that those who could afford to buy and maintain slaves actually did so in every case. General Robert E. Lee is a very good example of this. This is not to suggest that the run-of-the-mill southern soldier was AGAINST slavery, but I think, like the average Union soldier, indifference was probably the most accurate way to describe the general sentiment towards the issue for most. To suggest otherwise is as unfair as it would be to say that the average American soldier today fights because he or she has an overall dislike for Muslims. That may be true in some cases, but in most, that never enters into their thought process. They simply fight because of an innate sense of duty to many things they hold dear, moral or otherwise. I also like how you find one questionable document, and suddenly it throws doubt on every document ever kept for half a century. That was cute. I'm not saying that the Civil War was not primarily fought over slavery. That was the central issue. But like most wars fought throughout human history, the reason why wars are declared and the reasons why soldiers fight them are often very, very different. It's woefully ignorant of the sociological interaction perspective to say that to the rank-and-file on either side, slavery was on the forefront of every man's motivations. "it's also a logical fallacy to assume that men who fought for the North cared one way or another about the fate of slaves in the South." Good thing I did not make that argument. If you are responding to me, please confine yourself to arguments that I have made, rather than debating strawmen. "General Robert E. Lee is a very good example of this." Lee is a very good example of what? Of how lots of Southern whites in slaveowning households thrived off of slavery no matter whose name showed up on the Slave Schedule as the legal owner? "Indifference was probably the most accurate way to describe the general sentiment towards the issue for most." Take a look at Masters of Small Worlds and What This Cruel War Was Over for a primer on this subject. "I also like how you find one questionable document, and suddenly it throws doubt on every document ever kept for half a century. That was cute." I'm not sure what you mean. 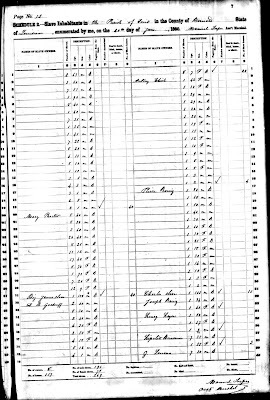 The Slave Schedule from the Census? I gave some examples of ways the Census over- and underreports slaveowner data, but it's a massive document. Feel free to look for yourself — it's public record, available through Ancestry.com at your local library. Also LOL forever at the Census being "one flawed document" if that's what you meant. "It's woefully ignorant of the sociological interaction perspective to say that to the rank-and-file on either side, slavery was on the forefront of every man's motivations." Not sure who you're arguing with here. This post says nothing of "every man's motivations." It is narrowly confined to rebutting the fallacy that a tiny minority of white Southerners were slaveowners. I think it's telling that your response to the argument of this post is misdirection, rather than engagement.